E-Learning is nothing but simply learning using electronic technologies and devices; that is going access beyond the traditional paradigms. It refers to a course, program or training delivered completely online. It is not a course delivered via a DVD or CD-ROM, videotape or over a television channel as E-learning involves the use of a computer or electronic device (e.g. a mobile phone) in some way to provide training. Hence; it’s a learning system based on formalized teaching but with the help of electronic resources which is known as E-learning. E-learning can also be termed as a network-enabled transfer of skills and knowledge, and the delivery of information is made to a large number of recipients at the same or different times. 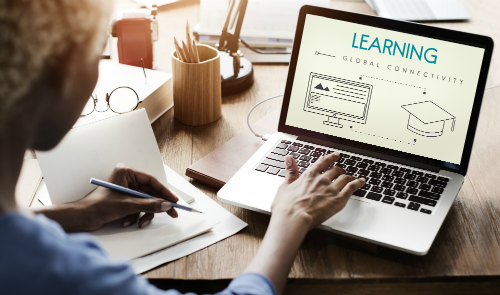 E-learning stems from the ongoing incorporation of technology—specifically computer systems and mobile devices—into learning and business environments. E-learning allows you to expand your knowledge whenever and wherever. Why not move employee training online with more employees working remotely and with the convenience of online learning tools? This a definitely a more convenient way to train employees, as the resources and costs savings can yield more by moving training online. Creative Social Intranet comes equipped freshly with Online Training to facilitate eLearning, onboarding, employee training and more features. E-learning helps make learning more accessible for learners around the globe. Research also seems to indicate that a more technology-rich environment delivers greater impacts. When learning training materials are available online, new employees can access their required information from anywhere and at any time using any electronic device. E-learning courses can use a variety of content, including audio and video lectures, presentations, assessment, assignments, polls, surveys, reading materials, multiple choice question answers and more. Perhaps the most important aspect of a well implemented E-Learning Management System is that it makes it easy to track and prove the progress of learners. This can be essential for E-Learning courses where proof of mandatory training is required. A variety of studies have evaluated the impact of eLearning and concluded that— supported by holistic approaches that include appropriate policies, infrastructure, professional development eLearning can help produce positive outcomes. For administrators and managers, e-learning is a more affordable and efficient way to conduct learning and training. E-learning helps save time, money, materials, and resources by keeping everything online. A larger number of learners and employees can participate in learning or training initiatives at the same time as it is available online. Some learners don’t feel comfortable learning in a large group, especially if they find something difficult to understand that their co-workers do not have any problem with. E-learning allows each learner to tackle the subject at their own pace, with interactive tasks being set in place to ensure a thorough understanding throughout each chapter or module. In business, it helps unite and train an increasingly global workforce. How can you implement our special E-learning feature? You can facilitate employee training online through CREATIVE SOCIAL INTRANET’S simple, user-friendly Online Training Calendar. The Online Training Calendar provides a simple, interactive calendar interface to schedule, manage and organize training courses and seminars. In addition, you can use the Online Training Calendar application to reduce the time you spend on managing training within your office, bank, credit union or financial firm by allowing you to easily track, manage and report on new accounts. Listed below our features of CREATIVE SOCIAL INTRANET’S simple, user-friendly Online Training Calendar. Online Training Calendar helps to choose your class size, location, instructor and courses manager all from within the calendar itself. You can customize your training experience by uploading detail attachments and links to your courses and tags to assist employees in finding the courses they seek. With the Online Training Calendar, you can quickly manage course completion and registration work which can be a difficult task in large organisation. You can manage active course registration and also can add waitlists to your course options, to track alternate course attendees as well as measure the overall interest in the courses provided. Using the Online Training Calendar, you can schedule multi-session courses to manage multiple session employee training. Employees simply have to sign-up for the multi-session course through the Online Training Calendar by completing a single form. Detailed tracking and reporting is required for managing Online Training for an entire organization. The Online Training Calendar application assists to manage, track and report on class attendance, registration, waitlists and all other assistance required .